The Eye Shop, a stylish, new full-service destination for designer prescription eyewear, opened for business on March 15, 2012 at 432 Cleveland St., in the heart of downtown Clearwater, Fla.
More than 100 people attended the Grand Opening, which featured raffle prizes and food catered by Clearwater’s Greektown Grille. Pamela Rowan, The Eye Shop’s owner and operator, included a chance to give back to the community in the festivities. During the event, guests were able to drop off old prescription eyeglasses and prescription sunglasses for the local Lions Club to repurpose for needy individuals. Along with The Eye Shop’s array of sunglasses, prescription eyeglass lenses and prescription contact lenses, shoppers can find prescription swim goggles and scuba masks. In addition, special $99 package deals are currently available. Rowan will soon be including glasses from Chanel and Oakley, including prescription ski goggles. The shop also carries a wide variety of eyewear accessories such as chains and cords, cleaning supplies, cases and readers. Everything in The Eye Shop, from the cordial staff of doctors and eyewear reps to the sleek, modern white and yellow decor, is designed to invoke a welcoming environment. In addition to receiving fashion advice from aesthetic consultants, customers can receive comprehensive eye examinations on the premises from licensed optometrists. Leading the shop’s technical team is Rowan’s husband, Dr. Cary Rowan, The Eye Shop’s surgical consultant. Eye exams usually include a general evaluation of eye health as well as assessments of visual acuity, eye coordination, eye focusing, eye teaming and eye movement testing. Individuals who require eyeglasses will have a refraction exam to determine the appropriate lens power to compensate for nearsightedness, farsightedness or astigmatism. Those who opt for contact lenses will have a keratometry exam in which the curvature of their cornea is measured in order to determine the “base curve” of the contact lenses and ensure a precise fit. The shop’s eyewear professionals, chosen for their experience in the art of fitting glasses, can help each customer choose the prescription eyeglasses that best offset face shape, eye and hair color, skin tone, and other facial characteristics. “We strive for an aesthetic harmony, so we make sure the prescription, color and style all work with the frame you select,” said Rowan. 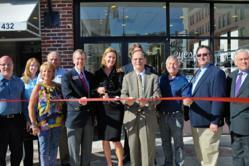 For more details on the Eye Shop, visit http://www.eyeshopdowntown.com or call The Eye Shop at 727-755-EYES. Located in the retail heart of Downtown Clearwater, the Eye Shop is designed to fulfill all optical needs. Dr. Cary Rowan of the Rowan Eye Center serves as the surgical consultant for Eye Shop Downtown, while wife Pamela Rowan applies her background in art and business as the shop’s fashion and retail director. The boutique’s mission is to offer personalized service and a wide variety of high-quality, affordable eyewear and lenses. Customers can obtain eye exams and other services on-site from a team of Board-certified optometrists, or bring in existing prescriptions to be filled for eyeglasses, sunglasses, contact lenses and more. For additional information, visit http://www.eyeshopdowntown.com.